"He stole my balloons! Why didn't someone tell me that he had one of those... things?" 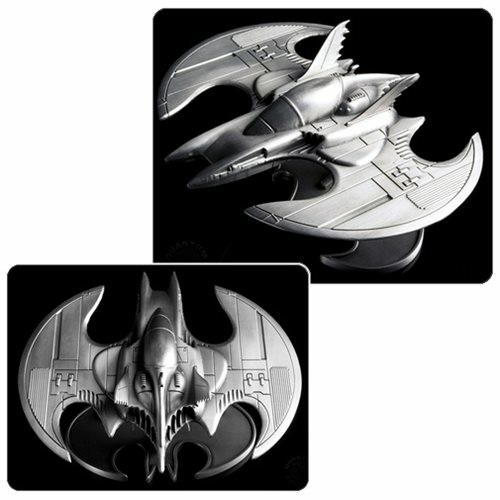 The Joker was mystified, but you don't have to be - you can get your very own Batman 1989 Batwing Metal Vehicle Statue right here! This 6-inch wide miniature replica from QMX Caliber Metalworks brings you a high-quality vehicle replica with a Batman-symbol base, forged from the finest materials in collectible metal wares. It's bat-tastic, bat-credible, and you'd be batty to miss this one. Measures 6 3/4-inches x 5 3/4-inches and approximately 3-inches tall. What Do Batman and Heavy Metal Have in Common?